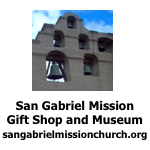 The date of the San Gabriel Empty Bowls fundraiser has been changed to Sunday, April 24th. It is still at the Sierra Madre United Methodist Church. I should have tickets to the fundraiser in late March. Please put this on your calendar and plan to attend.